The rasterized map of permafrost temperature of Yakutia, East Siberia, was derived based on the map of landscapes and permafrost conditions in Yakutia (Merzlotno-landshaftnaya karta Yakutskoi0 ASSR, Gosgeodeziya SSSR, 1991). The data represent the period 1960-1987. The original Russian map has been digitized into several GIS layers, scale 1: 2 500 000. Based on this digitized version fine scale raster images with a resolution of 0.001 degree have been produced. Subsoil temperature were assigned a probability density function at the 0.001-degree spatial resolution to estimate mean and standard deviation soil temperature at 0.5-degree grid cell size. 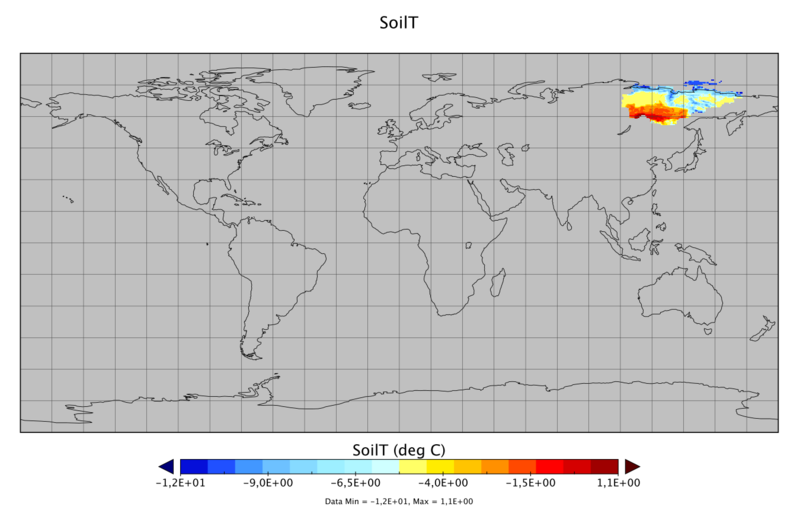 For most of the landscapes the subsoil temperature represents permafrost temperature. For regions with isolated patches of permafrost it represents the average of permafrost temperature and non-permafrost subsoil temperature. Spatial pattern are dominated by a climatic gradient from north to south, and by mountains and the soil type distribution. Uncertainties are highest in mountains and in the sporadic permafrost zone in the south. The maps are best suited as a benchmark for land surface models which include a permafrost module. A rasterized map of active layer depth is available from the same data source. For more information on the data source and data processing see the accompanying paper by Beer et al. (2013) in the 'Data and Resources' section.